Somewhere along the line we’d both envisaged this day. It was our last ride. 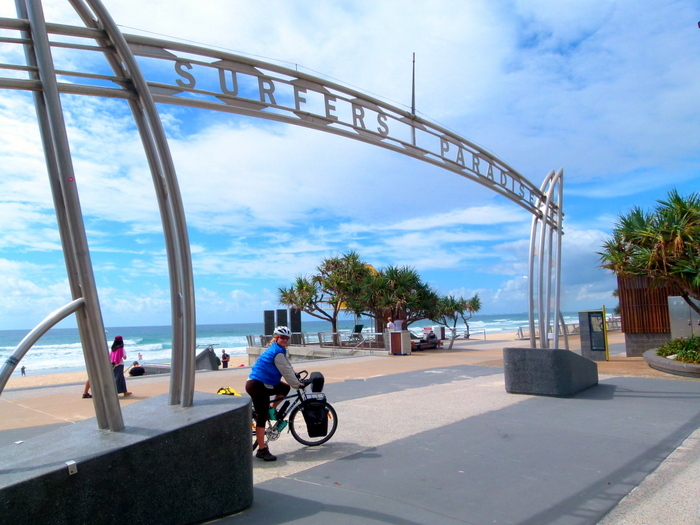 The final ride of a trip that has crossed a continent on bicycles newly purchased in Perth. A ride that chalked up our 7000th km and would be our final leg of 3 transcontinental journeys. In the last 2 years we’ve completed Trans-Asia, Trans-Africa and now Trans-Australia. We’ve seen amazing places like Tibet, the Silk Road, Iran, West Africa, Madagascar, Ethiopia and Sudan. 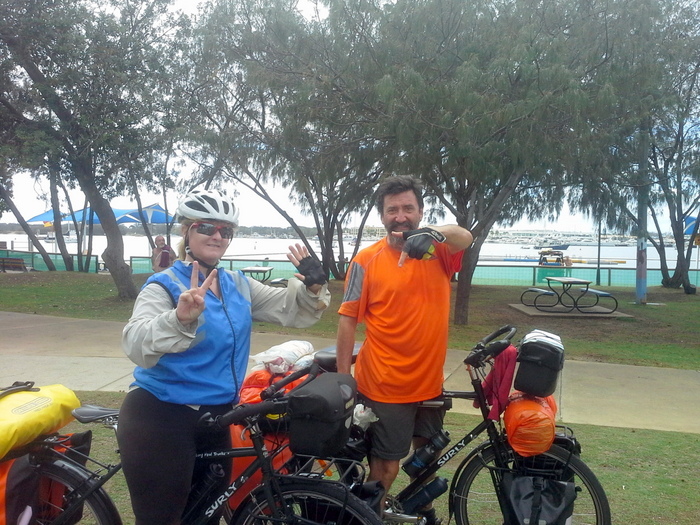 We’ve cycled across the Nullarbor, through The Coorong, along The Great Ocean Road and braved the chaotic streets of the Gold Coast with its high density tourism and proliferation of P Plate drivers!! We’ve also been privileged to meet a world of people from all walks of life. It has been both our toughest and most rewarding journey. So this last day, this last ride, holds a lot of meaning for us. The inevitable congestion of traffic and choking fumes on the busy roads into Brisbane will long be forgotten as a resounding sense of achievement blurs out both the hardships of the trip and also the reality that it is over for the time being. Unfortunately we need to work again so that we can feed our wanderlust once more. From the very start, we designed this trip to be a challenge. That’s what travelling is all about for us. Make no mistake, we don’t consider what we do to be a holiday in any sense of the word. Budget travel in Asia and Africa is always a challenge. Avoiding conflicts, corrupt officials and miles of red tape are just daily prospects. Your personal safety in these places is never taken for granted and timetables are not to be taken seriously. You need to be prepared for anything, and therein lies the challenge. Remaining indefinitely out of your comfort zone isn’t everyone’s cup of tea, but that’s exactly what we seek to do. So, back on home soil we chose to challenge ourselves once more. The bicycles were inspired from our 10 days in Bishkek, Kyrgyzstan where we were privileged to meet a dynamic and adventurous group of touring cyclists from various countries. They all drank, many of them smoked and all of them told tales worthy of any “Boys Own Adventure”. To us, travel veterans of over 75 countries at the time, who were becoming a little jaded with how technology has changed backpacking, these people were the personification of travel. We sat down each evening around an outside table with heaps of beer and were spellbound by epic tales of endurance, exotic places and extraordinary people. A seed had been planted. It is with great fondness that we remember our short time with Sergai and Adrienn, Alex and Marty, Dia and Yoyoi, Irene and Michel, Wataru, Tomoko and Yannick. The spirit of adventure is alive and kicking in these people and we’ll never forget our time with them. 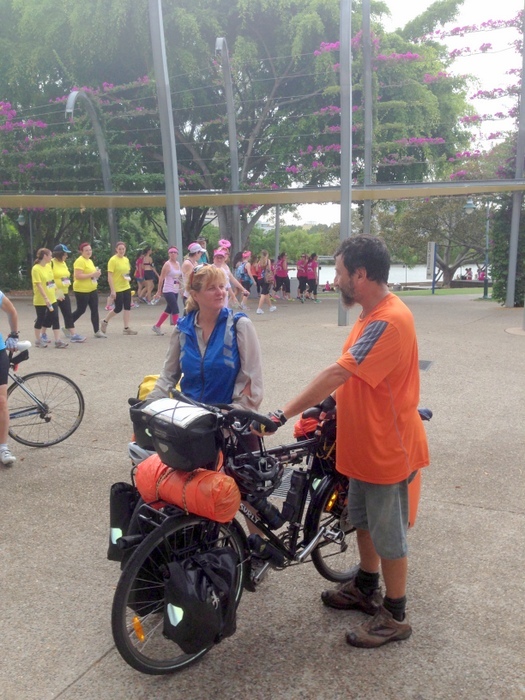 Arriving at Southbank Parklands – Finito! All our hopes for the bicycle crossing have been realized. We have met at least a dozen new people every day, curious to understand what we were doing and what we hoped to achieve. We never ever got sick of telling our story and still get a buzz when someone asks us about it. I’ll never forget our very first coffee break on the trip in Freemantle. A couple of guys came up to us admiring the loaded up bikes. “Nice bikes”, they said. “How far have you ridden?” I held my left wrist up to look at an imaginary watch and said “about 30 minutes!! !” The look on their faces was priceless. Over 7000 km and 6 months later, I’d love to run into those guys again! It would be remiss of us not to thank the dozens of people who helped us along the way. Complete strangers offered us everything from cold water, to a bed for the night, to cash to see us by. (Please note we refused that last one!) Our families and friends housed and fed us for days at a time, organized food drops, provided places to stay, the use of their cars, transport cards and the much appreciated home cooking. Thanks to one and all, we’ll look forward to returning the favour one day soon we hope. 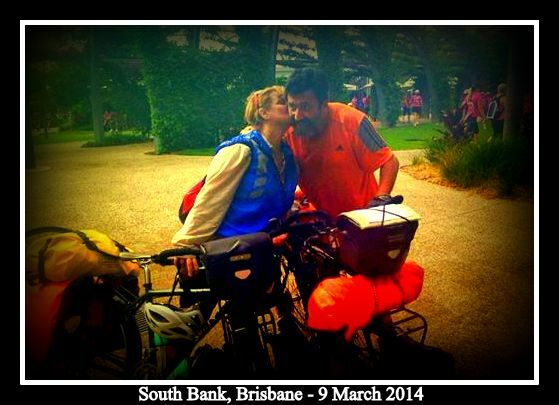 And thanks to those who rode on the final 5km to Southbank Parklands or just turned up to give us a much needed hug. There’s nothing better than to share a special moment with loved ones. So ends our time on the road – For now!! If you think we’ve satisfied our thirst for adventure and new places – think again. Once again the horizon beckons us. This time we’re off to Vietnam. A 12 month gig teaching English will replenish our funds and give us time to think about and plan the next big journey. Did we just do that??? 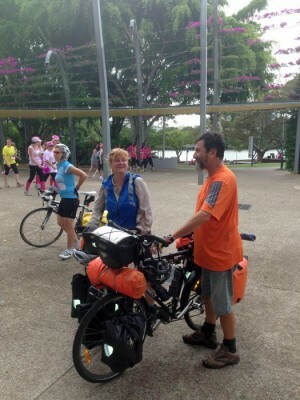 Really 7000km on a bicycle? Thanks for reading about the journey on the website. It’s not the end of our stories, there a lot more to come here as well. So make sure you “follow” to stay in touch or “Like” us on Facebook for updates. Who knows, we may meet on life’s highway one day. I hope so, but until then – keep taking the long way home. Thanks Jenso, Always looking forward to a new adventure.